Cards on the table, I love pop-punk. I think it’s brilliant that even people who aren’t necessarily big fans of pop-punk artists can’t help but tap their feet to the rhythm when they hear the infectious choruses and upbeat nature of the tracks. However, recently it seems that any group of people that can play instruments can churn out something just catchy enough to fall into this category, leaving a lot of people tired of hearing the same chords played across four minutes. 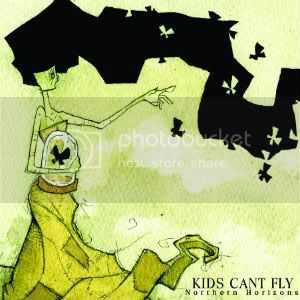 Enter Kids Can’t Fly with their EP, ‘Northern Horizons’, demonstrating that they have the sheer talent and originality to present to you what people love about this genre. They ensure they don’t get caught up in the tide of the generic sound by including a saxophone and a trumpet player in their line-up and across the album to create their trademark sound. The ability of fellow bandmates becomes clear immediately on new single ‘Esmeralda’, boasting an impressive guitar solo and a chorus more difficult to get out of your head than anything that Carly Rae Jepsen has to offer. Frontman Robin Black has a vocal style that allows his accent to influence his singing, providing a very distinctive sound which is just something else to make this band stand out. Case and point of this is highlight of the EP, ‘Happily Never After’, complete with an almost parade sounding introduction and tongue-in-cheek lyrics that Fall Out Boy would be proud of. The only disappointment of this record is that it’s criminally short for a band busting at the seams with potential. At 4-tracks long, it leaves you begging for more, although with a full-length album planned for the end of the year we shouldn’t be waiting too long. If you’re a fan of this genre then you need this EP in your life, it will cost you a couple of quid but it’s so very worth it. If Kids Can’t Fly carry on creating music like this, then 2012 could be the year that sees them explode onto the music scene. Go and get this EP, you won’t regret it. NEWS: Late Night Fiction announce July headline UK tour! NEWS: Kids Can’t Fly to tour with The First later this month! NEWS: Kids Can’t Fly to perform Liverpool gig with Rampworx Skatepark! NEWS: Kids Can’t Fly offer new single ‘Stick To Your Guns’ for free download!